The ECL 230X TDB is a code compliant, battery alarmed, rugged 3-point dead bolt, panic device with photo luminescent sign providing maximum security and a 100 dB alarm for secondary exits. Proven durability and reliability at a resonable price. Easy installation which saves time and money. 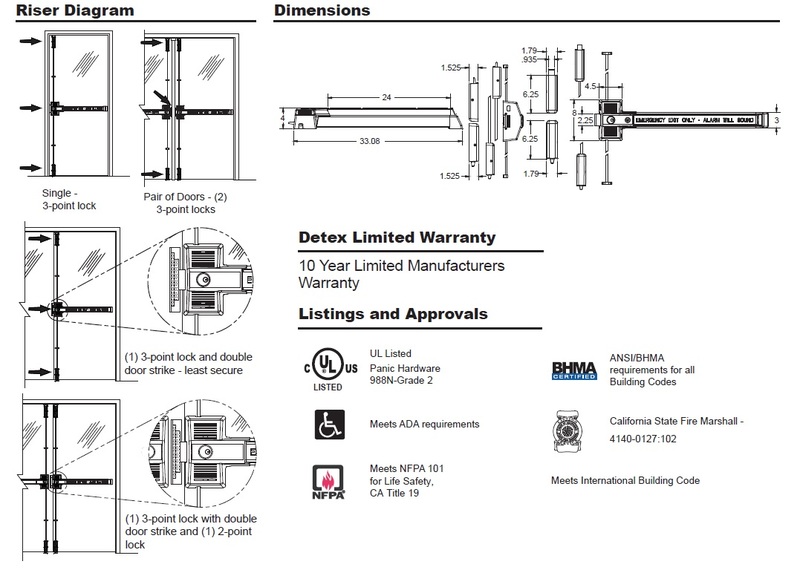 One size fits 36" to 48" doors for code compliant acceptance. Photo-luminescent sign is easy to see in the event of power loss. 3-Point, 1" throw dead bolt lock with over 3/4" engagement with the frame, and 3/4" throw top and bottom locks with 5/8" engagement with the strike. Accepts 5-pin through 7-pin standard and interchangeable core rim cylinders without cylinder collar. Locking and unlocking the dead bolt always arms and disarms the alarm. Resetting of the alarm can only be accomplished with a control key.